RUNES, BlackBerry Shots, Minneapolis, Minnesota, December 2009, all photos © 2009 by QuoinMonkey. All rights reserved. 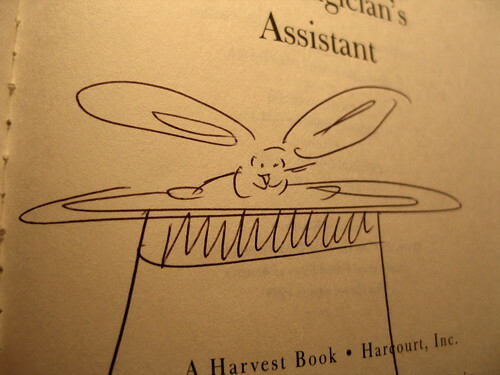 Yesterday we went to a book signing at Common Good Books. Jeff Hertzberg and Zöe Francois recently released their second book Healthy Bread in Five Minutes a Day. The bread was delicious, the authors serious about their work, down-to-earth, engaging and fun. In casual conversation, it came out that Zöe knows Latin. I remembered that I had taken two years of Latin in junior high, a curriculum requirement in the 1960’s. That got me to thinking about language and alphabets. After the signing, Liz and I did a little Christmas shopping and later went to the studio. 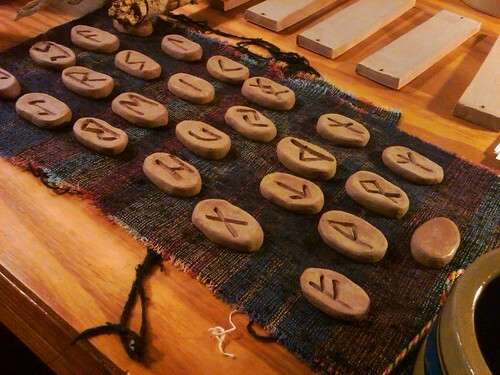 I was looking at this set of Runes I made from clay a number of years ago. For a period of time in my life, I consulted with different oracles on a daily basis: the I Ching, the Runes, Tarot, Medicine Cards. I have a passion for learning about symbols in different systems of mysticism. I couldn’t find my Runes book last night or I would have drawn the Runes. But I did find an odd book I’d snapped up at a sale, an old Readers Digest Book of Facts. According to the Languages section of the book, all the alphabets around the world can be traced to a North Semitic alphabet that emerged around 1700 B.C. at the eastern end of the Mediterranean. From the Semitic alphabet developed Hebrew, Arabic, and Phoenician. Then Phoenician alphabet was adopted and adapted by the Greeks who in 1000 B.C. introduced a modified form into Europe. The Greeks standardized the reading of written lines from left to right, added symbols for vowels, and gave rise to the Roman alphabet (used for modern Western languages) and the Cyrillic alphabet (named after Saint Cyril and used in Eastern Europe and the former Soviet Union). 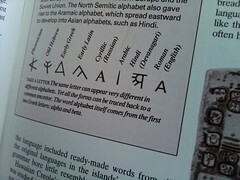 The North Semitic alphabet spawned the Aramaic alphabet which eventually developed into Asian alphabets, such as Hindi. The earliest forms of writing are picture writings found on clay tablets in parts of the Middle East and southeastern Europe. Some of the oldest found in Iraq and Iran recorded land sales and business deals. Where do the Runes fit into all this? They are a mystery. The Runic alphabet is one of the oldest in northern Europe with early examples dating to the 3rd century A.D. They have been found in 4000 inscriptions in Britain, Scandinavia, and Iceland but nobody knows for sure where they originated. For some reason, the Runes remind me of the ancient celebration of Winter Solstice. Some scholars believe the Runes were derived from the Etruscan alphabet of southern Europe and brought north by the Goths after their invasion of the Roman Empire. To me, they are an oracle of mystery. And that’s what draws me to them. Post Script: The bread baked by Jeff Hertzberg and Zöe Francois was delicious. Their new book Healthy Bread in Five Minutes a Day looks like a winner with many whole wheat and gluten-free recipes. There’s a recipe for their whole wheat Christmas Stollen Bread in the post of their video interview at KARE 11. Or you can visit their website Artisan Bread In Five with fabulous photographs of mouthwatering baked goods. You will come away hungry for more! 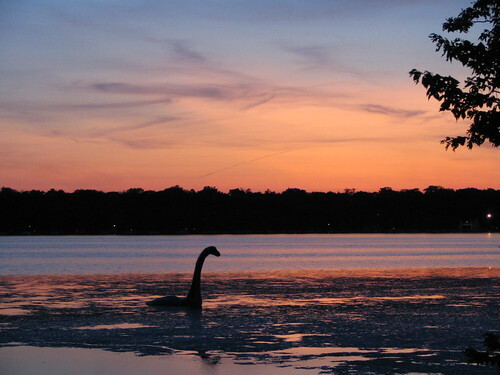 Not A Velociraptor, Lake Creature spotted in Lake Harriet, Minneapolis, Minnesota, July 2009, by QuoinMonkey. All photos © 2009 by QuoinMonkey and SkyWire7. All rights reserved. Liz and I set out on my birthday to geocache around the Minneapolis chain of lakes. One of the joys of caching is the chance to learn about local history that might otherwise be swallowed by day-to-day routines. We dropped off two Travel Bugs and scooped up three caches that evening. Along the way, we headed over to the edge of Lake Harriet to listen to a full orchestra perform at the band shell and waved to passengers on the retro streetcar rumbling along tracks that stretched all the way from Minneapolis to Lake Harriet in the 1880s. Perched high on glacial debris, Lake Harriet was formed when continental glaciers spread over Minnesota during the Great Ice Ages. Starting with the Mississippi River channel at the Plymouth Avenue Bridge, a preglacial valley runs almost directly south beneath Lake of the Isles, Lake Calhoun, and Lake Harriet to the Minnesota River at Bloomington. Lake Harriet lies 250 feet over this ancient valley filled by glacial deposits, and is nestled between hills that piled up when the ice front paused in its final retreat about 10,000 years ago. 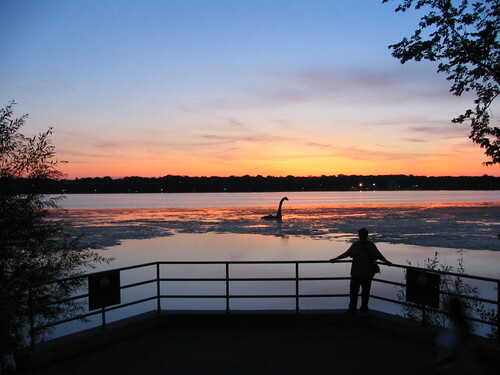 At dusk, we were making our way home when Liz spotted a shadow skimming the lake surface with a shape much like Dino, the Flintstones’ pet dinosaur, or a distant relative of the Loch Ness monster. Quickly pulling over to the side of the road, we scooted down the hillside Indiana Jones style, and landed right smack dab next to the Minneapolis Lake Creature. Had it risen from the depths of a preglacial valley? Several fishermen paddled behind the creature oblivious to any danger; we decided it was safe to approach. The air smelled like honey, the night quiet and breezy — no mosquitoes. The sun fell behind the oaks, ash, and elm. A couple on a tandem bike stopped to photograph the 13-foot creature. Kids could not resist leaning over the edge of the rails to get a closer look. “I wonder if it’ll move,” one boy said. “Yeah, we wouldn’t be standing here for long!” his sister replied. Everyone was drawn to the mystery — the power of public art. The Minneapolis Parks Foundation and artist Cameron Gainer came together because of our shared passion for the arts and belief that public works of art can truly enrich a community and the lives of its residents. We are proud to bring that passion and belief to life with Gainer’s _[ and invite people to share in her beauty while enjoying the Minneapolis parks with family and friends. Gainer’s work includes film, video, sculpture, and performance art and explores human perception and the notion of “cinema inside out” when you encounter something in an environment and are not exactly sure what you are looking at. Symbolically titled _[, Lake Creature is based on the iconic, “Surgeon’s Photo” of 1934 that was presented as evidence of the existence of Scotland’s Loch Ness monster. Though later proven to be a hoax, the photograph remains a universal representation of the mystical lake creature. 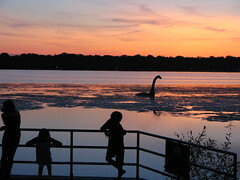 Lake Creature At Sunset, Minneapolis, Minnesota, July 2009, by SkyWire7. 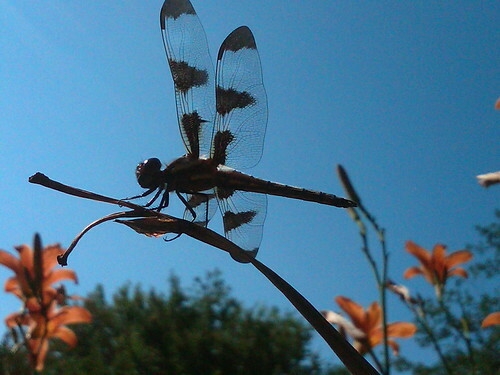 All photos © 2009 by SkyWire7 and QuoinMonkey. All rights reserved. The Lake Creature project leads me to think of Everyday Poems for City Sidewalk, another public art project collaboration between Saint Paul Public Works and the City of Saint Paul. These projects are living reminders of how the Arts matter and I’m grateful to all the people and organizations that make them possible. 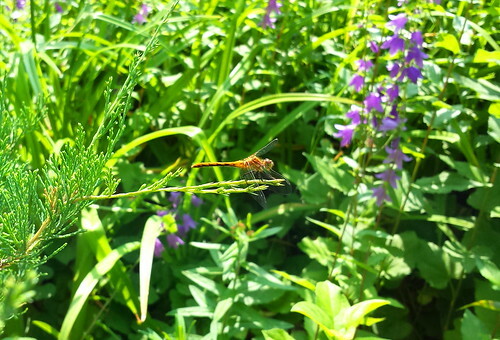 _[ has been seen in New York City, the Salt Marsh Nature Preserve in Brooklyn, and Key West, Florida and is making plans to explore another Minneapolis lake sometime this summer. Keep your eyes peeled on a lake near you. There is also a storytelling contest to name the Lake Creature and create the mythology surrounding her life. What nickname would you give to the Lake Creature? You can enter the contest and tell your story at Nickname the Lake Creature. Dance by the light of the moon. Which moon? September, the Harvest Moon, the Yellow Leaf Moon. But if you are Haida, near the cool waters of Alaska and British Columbia, it might be the Ice Moon. For the Ojibwe, the Rice Moon. Cherokee, the Black Butterfly Moon. Climate changes the way the moon clings to the sky. No matter the temperature, September is a transitional month. Warm one day, cool the next. Nights start to dip. On the last day of September, our heat kicked on for the first time. We opened the windows to let the “burnt dust” smell flow out into the wind. Then bundled up on the couch. It’s sweatshirt season. The time to dress in layers is upon us. The Harvest Moon always looks bigger to me. The full moon was dramatic, a red smear across the sky. You could barely make it out behind the mist off the lake. I start to go inside in the Fall. I am internal. It’s a good time to write. And rest. I would miss the seasons so, if I lived in a climate that did not shift with the turning Earth. I once thought I wanted to study the stars. That was before I saw how much math was involved. The exacting part of the Heavens is fascinating. But the mystery is what holds me. Not knowing is more exciting than knowing. I still believe in Santa Claus. Fairies are alive and well with the Hobbits in the forest. Trolls and gnomes dot the darkness of Sleepy Hollow. I’ll take the mystery over the facts any day. That doesn’t work in real life. You can drown in what you don’t know. There’s a fine balance between being informed and obsessed. But I remember writing practices on — What are your obsessions? Because they hold a lot of juice. What are my obsessions? I watch the Moon, the Sun, the Stars. I want to know what makes the Earth tick. I’m obsessed with understanding love and forgiveness. The breakdowns, the shattered dreams, the loss of control, the forgetfulness of the last broken heart, the wild abandon that makes a person fall in love. I am obsessed with wind and trees. A single burnt umber leaf against a cerulean sky (I like to say the word cerulean). I want to understand what makes a family tick, the ghostlike qualities of memories, how we come to love the people we love, why people stick, then fade into the sunset, or drop off entirely, the clean hatchet cleave. Sharp. Close. Far away. Serrated. Here. Gone. I’m obsessed with photography, mandalas, finding my way in spite of the erratic, misleading compass needle. Where is True North? I want to know where I fit in. I’m obsessed with community, with the good work of everyday teaching, with the smell of wood smoke and the sound of the Downy woodpecker snapping away on a turning ash branch. Have you ever noticed the erratic way a woodpecker flies? They look like giant hummingbirds, darting, rising, falling, but always landing on their feet. Sideways, clinging to the side of a rough barked tree. I’m obsessed with what connects and what separates. And why humans can’t seem to grasp — there is no difference between the two. The 9th Full Moon has passed. Farmers plow bulging fields by the light of the moon. Two years out of three, the Harvest Moon falls in September. Corn, rice, beans, and wild rice reach their full potential. Under the Maize Moon, where the deer paw the earth, why can’t we?